Danny Gamboa’s Ghost Bike installation for Susan Curtis, who was killed in Long Beach on January 15. Photo courtesy of ZKO Films. 2011 marked an extraordinarily hard year for Long Beacher Danny Gamboa: cyclists seemed to be getting killed far too often. In that year alone, Southern California saw a staggering 70% increase in deaths from 2010, with 70 cyclists losing their lives in the seven-county region of SoCal alone in 2011. And in a rather morbid way, Gamboa saw this as the moment to meld his desire to begin making documentaries with his love for cycling—in this case, following the Southern Californian men and women who place memorial Ghost Bikes at the locations where a cyclist had lost his or her life. Not to be confused with San Franciscan artist’s Jo Slota’s project of the same name1, Ghost Bikes were largely inspired by late 90s New York bicycle and pedestrian advocacy group Right of Way, who memorialized cyclists and walkers by stenciling police-like body chalk outlines where the victims had been struck, accompanied by their names and dates of death. The first stencils were created on December 13 of 1996 in Manhattan to memorialize 3-year-old Erica Morena2, who was ran over by a driver who jumped a curb to beat a red light in 1990; Jie Zhang3, a 29-year-old woman, nine months pregnant and struck outside New York Hospital/Cornell Medical Center in 1994; and 33-year-old Rosemary Brodie4, a cyclist killed in October of 1996 by being doored. Following these stencils, the first Ghost Bike appeared in London in 1993 at King’s Cross to commemorate Min Joo Lee, a 24-year-old student killed on October 3 of that year—and now over 500 Ghost Bikes are on display throughout the world. And rightfully so, Gamboa and his producer Kat Jarvis through their production company ZKO felt that this phenomenon—particularly given the egregious spike in cyclist deaths in Southern California—deserved to be documented. “I knew my friends were putting up Ghost Bikes—and I knew it was something that was near and dear to my heart,” Gamboa said. “You get close-calls every day just biking around and…” He trails off, silently indicating that, though it shouldn’t be, oftentimes mixing the worlds of bicycling and driving becomes a gamble. The Ghost Bike for Anthony Martinez of Oxnard, whose story inspired Gamboa to create a full-length feature of his documentary. Photo courtesy of ZKO Films. Gamboa decided to contact his friends who were putting up those Ghost Bikes—Leslie Caldera and Ed Che—and the day he called, they happened to be putting one up that night. 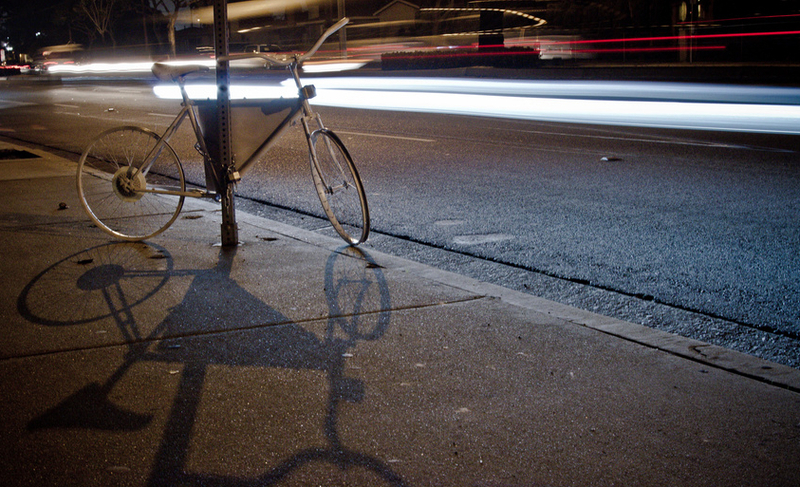 Soon after, Gamboa began following as many Southern California Ghost Bike installation as he could, eventually building up his collection of footage into a current 11-minute rough-edit short, Ghost Bike: A Cyclist Was Killed Here. Though he plans to release the short soon, he has larger plans for expanding the piece into a full-length feature. His inspiration for expanding upon the film was both a personal and touching one. 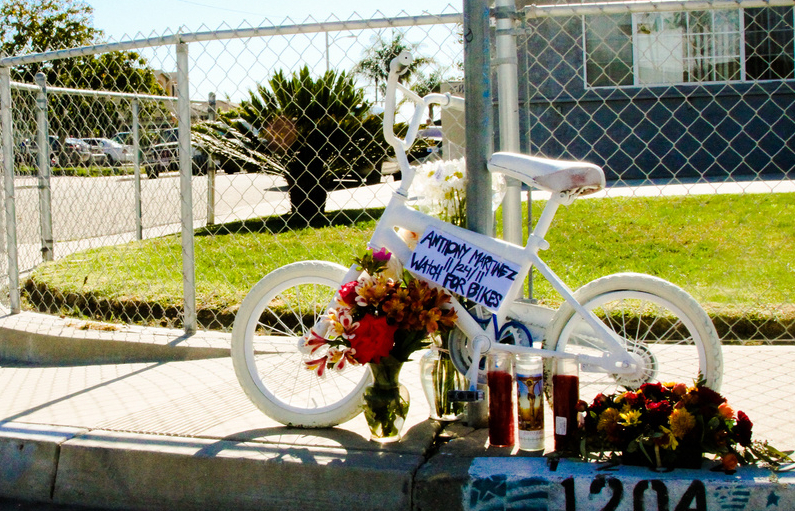 After hearing of 6-year-old Anthony Martinez being killed in Oxnard on Thanksgiving Day in 2011 after riding along his neighborhood street, Gamboa painted one of his own son’s bike to commemorate the loss. With three other friends, including Jarvis, they arrived at midnight to have a man approach them with a curiosity as to what they were doing. Immediately choking up after hearing of their purpose, the man identified himself as the child’s uncle, who taught him how to ride a bike. Pulling the family out and standing in silence, Gamboa realized that the existential, humanistic aspect of each Ghost Bike supersedes any political factor. “Every single Ghost Bike has an individual story behind it. The more families that come forward to say, ‘Thank you,’ the more we need to do this,” he said. Gamboa—given this realization—will not only continue documenting Ghost Bikes, but installing them as well. His most recent Ghost Bike installation was to honor 50-year-old Long Beach cyclist Susan Curtis, who was struck while running a red light near Bellflower Boulevard and Atherton Street. 2. According to the New York Times, Erica was walking with her mother when a 1987 Mercedes sedan “careened through the intersection [and] mounted two sidewalks.” With no action taken against the driver, he informed police that he lost control of his vehicle after the accelerator stuck. 3. Zhang was crossing the York Avenue at 69th Street with her husband on October 24 of 1994 when a 1987 Ford van struck a wooden road divided, which then struck Zhang. Immediately going into a coma, hospital co-workers immediately began delivering her baby boy, Samuel, via C-section; he survived. The driver was asked to appear in court for driving on a suspended license and never did, his whereabouts still unknown to this day. 4. According to the New York Times, Rosemary was doored by a parked Cadillac sedan on October 28 of 1996, where she was projected into the street and ran over by a passing van. Despite a clear violation of NYC Traffic Code S4.12, the driver had no action taken against him. Sometimes on my bike commute to/from work here in toxic San Diego I feel I need to invest in ghost bike insurance. I have ridden that intersection. My husband fell, does not know how, at that same intersection and after losing consciousness, a few stitches and a trip to the ER was fine. I am grateful to the ghost bike people. We who ride know how it perilous it can be.